The Alley Way Stamps: July Release: Sneak Peek Day 3 OLD SCHOOL! Enter to win!!!! July Release: Sneak Peek Day 3 OLD SCHOOL! Enter to win!!!! Click on the Rafflecopter widget below to enter to win this set - Old School !!! ! You have until 7 pm TAWS time tonight to get your entries in! For our friends that do not have Social Media accounts, you can also just comment below. We will randomly pick commenters for our giveaways, too! This contest will run TODAY only (6/29/15), but we will have our blog hop tomorrow! Hi it's N@ Ali. This Old School set is fantastic, perfectly retro for those game loving ones if you want to put a smile on their face! Hi Friends! Meredith here with my creation using Old School! I've created a water colored panel using the game board piece stamped in a repeating pattern. I used my Distress Ink Markers and watercolor pencils to lay down my color. I then sprayed it generously with my Perfect Pearl water mixture and let it dry overnight to let the colors blend and move naturally. I added one of the many fun sentiments, some bright papers and rolled flowers to complete this happy project! Hi everyone, pacman (aka Tanja :-) ) from the Old School here! Be careful - I'll eat you ALL!!! Hi!! Dana here with my sneak of Old School!! Such a fun set that brings back memories of games i played with i was a kid and teenager!! Hi! It's Yuki here with my sneak peak of Old School. What a fun and nostalgic set. I decided to make a cute encouragement card using the Pac Man-themed stamps. Very cute idea for a stamp set. Love the dominoes and the Sorry pieces. This looks like a fun set I love the Pac man. These game pieces are a riot ... will be great for making some FUN cards!!! What a fun fantastic set! I will for sure be adding this to my list. Fun and sweet stamps set..Thanks for the chance to win!! I can't wait until tomorrow. Blog hop, here we come! Oh how fun are these sneak peeks! Will be great to have stamps to match the games. I love all of the old game piece. Awesome!!! Old School...OMG, this is such a CLEVER idea! I'm quite sure that 90% of us can relate to these games!!! Ha these images bring back so many childhood memories...love love love it! this is such a fun and creative set -- I don't think I've seen a game piece themed set before. Old school = new love! I played these as a kid, and love them with my own kids now as mommy! What incredible cards - from the simplicity of the domino card to the detail and incredible coloring of the sorry and each and every one in between - SUPER! TFS! 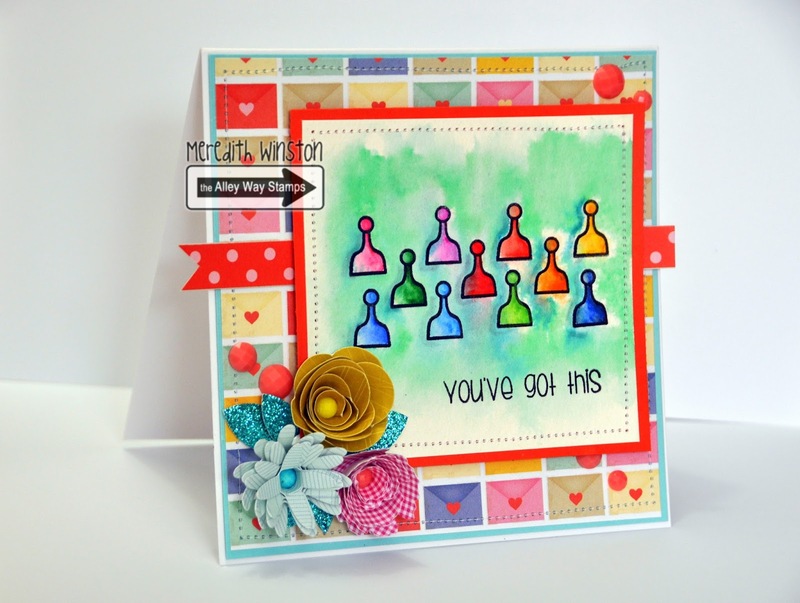 Oh my goodness...love this set and what a fabulous and fun idea for stamps! You guys are TOPS for coming up with great and fun and cool stamp sets - so very excited about this set and all these samples are total awesome-sauce!!! 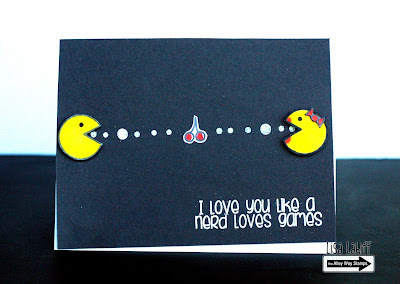 Love love love the Pac-Man images and cards! So darn cute! This reminds me of high school. Love it. I'm anxious to see the entire release! Love this adorable Old School set! The Pac Man image cracks me up! I used to love to play Pac Man, I haven't played in so long. I wonder if there is an APP for it. I love the Sorry pieces....one of my favorite childhood games! Wow! I like this new stamp set.